Inspired by the Indian origins of gypsies from Andalusia in southern Spain, Flamenco Natyam explores similarities between Flamenco and the dance and music of south India, since Carnatic music reflects the kind of music that the gypsies carried with away with them from India many centuries ago. Presented at the Guggenheim Museum NY's Works & Process series, and later on tour in India, Flamenco Natyam, began as a collaboration between Rajika Puri and flamenco dancer, La Conja, who traced similarities between Flamenco and Bharata Natyam - through rhythm and melody, footwork and gesture. The centre-piece of the show was PANI, a suite for sitar and flamenco guitar, composed by gypsy guitarist Pedro Cortes. 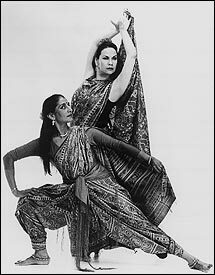 Pani, which means 'water' in both Hindi and Calo (the language of the Spanish gypsies), consists of an alegrias - choreographed as a solo with Indian movement by Rajika - and a solea por bulerias - danced as a duet by La Conja and Rajika. Rajika and Conja currently offer a Lecture-Recital during which they juxtapose the music, movements, and poetry of the two traditions, and also present their latest Flamenco Natyam choreography. The success of Flamenco Natyam leads to an addition to Rajika's current project with acclaimed Carnatic vocalist, Aruna Sairam. Their concerts of South Indian Classical Music, and its Dance include interactions with flamenco guitarist, David Serva and flamenco dancer, Clara Mora, during which they develop more extensive music, and choreography as a mosaic of the two traditions.